19세기 두만강 하구의 녹둔도 일대와 주변지역을 그린 지도를 엮은 지도첩이다. 이 지도는 20면이 절첩으로, 전체를 펼치면 3m 가량 한 폭의 대형지도가 되는 형식이다. 맨 앞장에는 지도의 목록이, 지도에는 지역별, 가구수, 인구, 물산, 군사관계, 거리등이, 그리고 맨 뒤에는 김광훈(金光薰)과 신선욱(申先郁)이 쓴 「청아여지형정석의서(淸俄輿地形情釋義序)」가 딸려 있다. 고급펄프지인 洋紙에 수묵과 채색으로 그린 회화식지도로, 전통적인 關防圖형식을 따른 함경도와 러시아 동부지역 지도이다. 김광훈, 신광욱이 두만강 어귀의 연해주 일대에 대한 정형을 16년간 정탐하여 제작하였으며, 제작 연도는 불분명하지만 1885∼1905년으로 추정된다. 조선과 제정 러시아 및 청나라의 국경 분쟁 연구 뿐만 아니라, 지도발달사와 회화사적으로도 매우 귀중한 자료이다. This is a 20-page folding album carrying a large map of northeastern border regions, reaching three meters when spread out. The front page has a table of contents, and the maps present the number of households, population, produce, military relations and geographic distances of various regions. At the end is a paper on the Cheonga yeojihyeong jeongseok uiseo (Detailed Topography of Qing and Korean Sides and Situation Analysis), jointly written by Kim Gwang-hun and Sin Seon-uk. 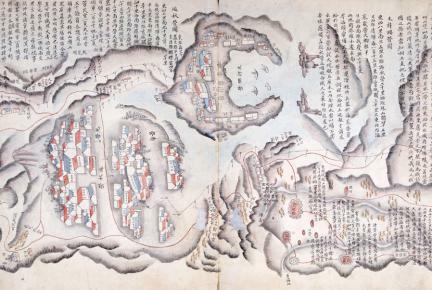 Drawn in ink and color on high-quality Western paper, the painting-like map depicts Hamgyeong-do Province and the Russian Far East in the typical frontier map style. The two mapmakers, Kim Gwang-hun and Sin Seon-uk, surveyed the border areas over 16 years for this project, but it is not known when they completed the map. It can only be assumed that the map was made between 1885 and 1905. It is valuable material for the study of border conflicts among Joseon, Russia and Qing as well as the history of mapmaking and painting.